The cabinets in here were like the ones in our kitchen... Oak... boring! So I painted them and put a glaze to age them. Love how they came out. So easy to do too! 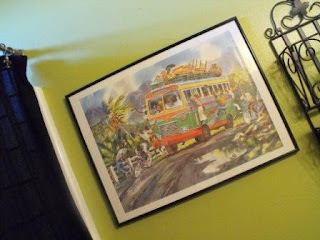 This picture we bought while we were at Sandals in Jamica.. Thats really how they drive... crazy! 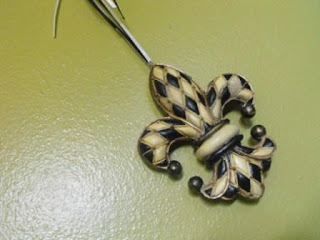 I love fluer de lis.. they are all over this room! I even have them here... Hope you enjoyed the tour of my hall bath...Beware! Teenager's room ahead!!! Oh Susie, I love your bath! What a great color combination and you have it accessorized so nice. Everything looks beautiful together. Please come do my home! I've been wanting to spruce up a little chest and your cabinet finish looks exactly how I'd love for this chest to look. I'm going to need details for that project, lol Thanks for sharing your bath, it's beautiful, just like every other part of your home you've shared so far. I'm on the edge of my seat waiting for more! 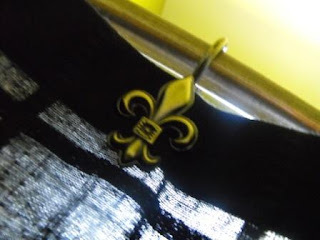 I love the color, the black accents, the fleur de lis, the print from Sandals...EVERYTHING!!! Black is the perfect accent color for that green...just lovely, so fresh and fun, yet very classy, too...love it! LOVE your bathroom. It gives me inspiration for mine as they are both small. Your accessories are wonderful. I love all the black accents...that is what I am moving toward. Hi sweet Susie! I love your bathroom - it's so classy! You have really pulled everything together so well! That Wally World mirror is so pretty! Who would know? Oh, please please come to my blog and see my tassels! They are absolutely adorable. I love them! I love it...I'm going to see if our Wal-mart has that mirror...I'd like it in my 1/2 bath...another great job...the tour is fun! 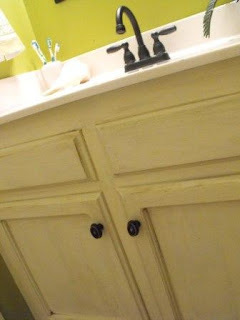 What paint and glaze did you use on your bathroom cabinet. I have some that are in desperate need of a facelift. I pulled this pic up last week to show my daughter while she was visiting. 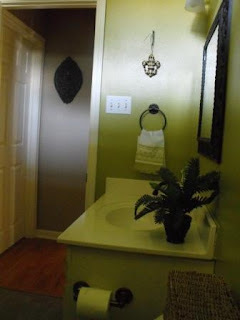 She wants her main bath to be green with the bronze fixtures and she had shown me a mirror like yours, so when I saw the pics in one of your post I knew it would help for her to see it. Coveting the magazine rack! Love your bath. I had a plan for our turquoise 1/2 bath and was at Michaels and saw some things on clearance and totally changed and it has all just come together. I am still working on it. Love when you find the pieces that speak to you and you get that excited rush and it all falls together. I love the color combination in there. Looks fun but elegant. The cabinets look fabulous. You would never know they were that builder's oak. Great job. I am such a green girl. I love it all so much. And I am also a black accent girl. Those combos are perfect together. I love the bathroom. Very nice. Teach us how to do the glaze. I have something that needs that process. I need to do this. Maybe I could get all the rooms clean. I'm loving the tour! I love that green color!! So fun! Very cute...it' looks a lot like my "master bath" same basic layout...thanks for the ideas...I can use some of them in my little hall bath...which makes yours look HUGE! I'm getting ready for a remodel of my 3 yr. old house and also readying my oak dining table and pine bedroom furniture to be painted white. I may also be readying for a divorce when this painting stuff white is done, sweet chickee!! Sigh..........well, maybe this marriage can be saved. After all we've been married 47+ years! Oh, the dilemma: marriage or white furniture. I think ya know which one is gonna happen, right?!?!? I remember you painting that color, right? I just love it! 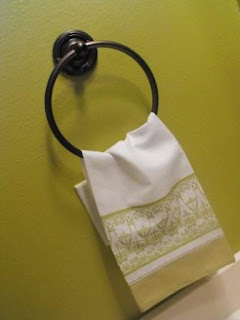 Rhoda has given me awesome ideas for our kids/guest bathroom so I am gonna get to work on it a little next week. I am excited!! 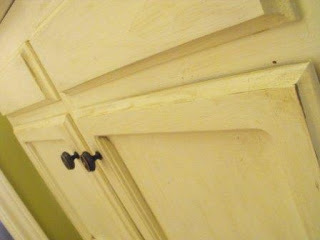 I would LOVE to paint/glaze my bathroom cabinets but am a bit afraid!!! HOW did you do yours? Please, share!! Yep i agree with everyone else on here it's very nice. The colours used compliment each other! Great! Susie, susie, susie!!!! Oh Susie...I love you! I spent hours on your blog last night and want to be your bff!!! I love the bathroom and I want that square wreath from Royal Standard. Really I want just about everything in your house. Love the tour. Thanks. Im adding you to my blog list. Wow! Going into your bathroom is like taking a mini vacation. It's elegant and fun! You knew I was going to ask about that magazine rack, didn't you? I just love it. Nice job on the cabinets too. 1. I need to know how you did your cabinets. 2. Love the green and black. So much I might be buying paint for a hall bath TODAY! I am a chicken sometimes at decorating. I know what I like when I see it but I just freeze getting started. I'm going to be more brave about this! Oh - and Lacy up there thinks you are going to be BFF...no way...I saw Susie's blog first! *I* am going to be her BFF!! ha! Ok I have to say this about that adorable bathroom, you have just got to have a black basket or tall little lamp with a TASSEL hanging from it! You just have to. That bathroom is beyond lovely, you have everything just right. If we all admit it we are probably off to a store somewhere thinking I could do this, well maybe! It's beautiful! One more question, what is this store you refer to "Roayl Standard". Is it online? Um, darling!! So, if it's not lime green, what color is it?? I love the painted cabinet with the glaze. What colors did you do?? I have been planning on painting our bathroom cabinet too. Such a cute site! Gorgeous bathroom, Susie! I love the Jamaican bus! Very pretty. It looks soothing and cool. The bathroom looks great! Green is one of my very favorite colors and I really like the one you've choosen here. You've done a lot with a small space and it is really so pretty. Thanks for sharing!! Which Sandals did you go to? We were at Dunns River. Loved it there! I like that mirror a lot and I love seeing how your cabinets came out. We have oak cabinets and I want to paint them, especially the bathroom ones. Yeah! I can see all of your pictures today! Love the bath. I can picture it in a slightly less limey color. ;-) Although I'm fond of limes. Especially in my cocktails! That picture cracks me up! Hubby and I went to Jamaica for our honeymoon and I remember being terrified riding in those buses. I can't believe more people don't get killed. HI! I have been lurking on your blog for a few weeks. Love the tour of the house! 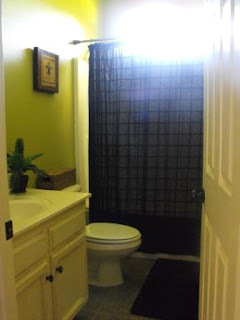 I would love to do the same thing to my bathroom...so I am going to add to all the questions you heard before. What is the process? How do you do the glaze!? I would love to know. You are so creative! Love Love Love your blog! Oh Oh and one more thing...Do you have directions for how you did the paint and glaze on those cabinets? I have been wanting to do that in my laundry room that I made all fancy and LOVE what you did. The bath looks great! Love the print - after having been in a taxi in Jamacia I can say you ain't kiddin - that is exactly how they drive! Your house is BEAUTIFUL! I just love every inch of it! I love all the Fleur de lies all over the house...I collect alot of fleur de lie things also! Anyway, your colors and style is great...esspecially love the cabinets that you aged...they look amazing! Yes, we all love the green. I painted our Great Room in the same color (with white accents) and at first was SO sad because I thought it might be too much...now it just makes me plain old happy - like your bathroom. Susie, that is a great bathroom and I can already tell I am in love with your home. I want to do that same thing to my kitchen cabinets? Can you tell me how you did it and any suggestions. oh wow - I love house posts! 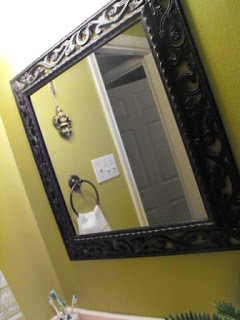 And that mirror is AWESOME - love inexpensive beauties! The colour is amazing! I wouldn't be brave enough ever to use green - but that is such a beautiful shade and it looks stunning! You're very talented! 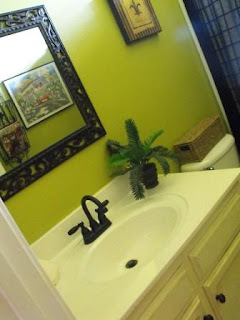 love your bathroom....I should have stalked over here before I decided to paint my half bath pink! 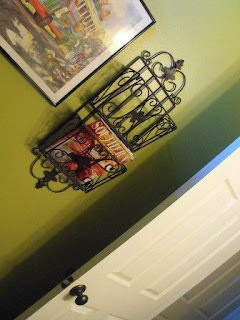 OOOOO and I love that magazine rack...is that southern living???? OK love it! I love the bathroom cabinet redo! The fabric is beautiful...can't wait to see the finished project. And your son's room is great...animals & all. My brother once put baby snakes in his pocket while playing...he forgot to clean out his pockets before putting them in the laundry for my mother...who checked all pockets!!! A lovely room, of course! i would love to know more about how you painted and glazed the cabinets. I like their antique-y look. My kitchen cabinets are the same oak and I can't stand them. But they are really good quality and it would be horrible wasteful to take them out. Other people in the condos who have painted tham had a terrible time of it and they look like "badly painted cabinets". Did you strip them first? sand them? latex or oil paint? Thanks Susie! I love your bathroom! 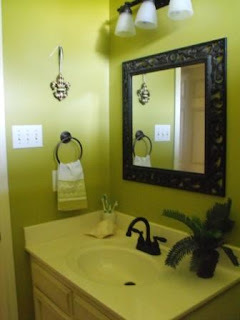 I have almost the exact same mirror in my half bathroom! I got it at Lowes, though. I saw Walmart carried one nearly identical for a LOT less money a few weeks afterward. Bleh.